We´ve got good news for all customers of T-Mobile! It seems the carrier is preparing to launch the new HSPA 7.2Mbps network and if everything goes according to plan, it should be operational by the end of 2009. The guys with AndroidandMe say they have been receiving reports from people across the country that indicate increased connectivity speed indeed. Two of the most credibly looking results relate to the average download speed in New York and Chicago that, as customers claim, is currently 3.8Mb/s and 5.4Mb/s respectively. Unfortunately, the carrier has not announced when the new network gets deployed officially. In case you notice changes or improvements, please, do share your opinion in the comments below. so... 1.5, 7.2, and 21mbs... ooh this network is gonna have some fun with us i see. As long as they done wipe people's info or as long as there are not blackouts. Haha! Granted it is just for dumbphones (and it is not voice), but Verizon's Mobile Web is down Nationwide right now... See, no network is perfect. http://www.engadgetmobile.com/2009/11/05/verizon-mobile-web-service-currently-down/ How ironic is this? What now, fanboys? Now T-Mobile Fanboys will be all over this... haha! Ironic! I just hope they don't get into the AT&T trend of things. I think the reason you see spotty 3G coverage with AT&T is because they would roll out one 3G technology and instead of increasing the area, they'd increase the speed in those major cities again and again. Verizon and Sprint, for the most part, have stayed with EVDO and only later increased to EVDO-Rev. A later on. Because of that, a broader area can see 3G...not as fast as AT&T, but on a smartphone, is it really that big of a difference? I hope T-Mobile provides 3G to a larger area instead of focusing on increasing speeds in a limited area. 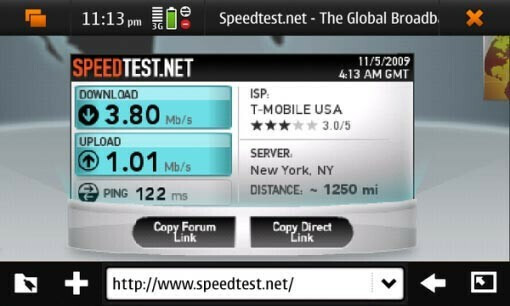 why T-Mobile wasting billions of dollars on 3G technology while other carriers using 4G. rath, tmo is going 21mb/s 3g. thats 7x faster than VZW is right now. granted its not the 100mb/s speed of LTE, but on regular smartphones what are you going to do that you can tell the diff? and when you get unl everything for 80 bux compared to 165 on VZW (inc tether since its part of tmo everything) its kinda hard to justify it. and the 21mb/s is now.. LTE is next year. 3g is now cheap to install so tmo should be rolling out a large nationwide map quickly.. and they are. with opera browser on my storm it feels like wifi. @Rath T-Mobile is going to roll out 4G Nationally around the same time as the other US Carriers. They've already planned this and its kind of Naive thinking that just because our Lovely Government too so long to evacuate their 3G bands thus rolling out 3G late that T-Mobile bought that they would completely ignore 4G.